In a gathering that lasted for two and a half hours, people listened and talked, sang songs, shouted slogans, displayed their beautifully crafted banners and posters and placards as they demanded, in one voice, #TenderRadduMaadi. On Saturday, March 16th, Bengaluru saw a gathering of thousands of people who came together to demand for cancellation of the controversial elevated corridor and to better public transport, footpaths and safe cycling and a more balanced and sustainable development of Bangalore and rest of Karnataka as well. This mass action was organized by a large coalition of citizen groups’ in response to the awarding of environmental clearance for the controversial elevated corridors project and floating of tender for Phase 1 of Elevated Corridors. Since the govt. announced its intention of taking up 100 km elevated corridors in the city, many civic groups had been campaigning for holistic city planning and due process for large projects in the city and meaningful citizen engagement in all of these. While the government kept assuring that they will call for public consultations, in an almost stealthy move, an environmental clearance was accorded for the elevated corridor project on a Saturday late evening, two weeks ago and tenders floated within hours! 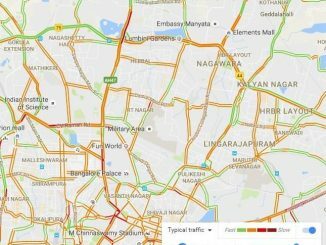 This hasty move is in complete disregard of the widely expressed public sentiment backed by strong research and evidence is what prompted citizens to come together in large numbers to demand that the government cancel the tenders and explore more effective and economical alternatives for Bengaluru’s traffic problems. 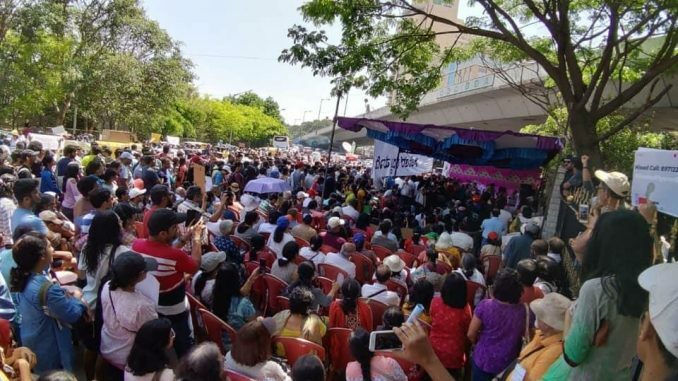 58 organizations and citizen groups came together in this protest gathering which saw more than 2500 people coming out from across the city on a busy Saturday morning to Maurya Circle on Sheshadri Road. The very lively gathering of citizens of all ages and gender and class rang with clear calls of not only “Tender Raddu Maadi” and “Elevated corridors beda“, but also “Bus lanes beku“, “Suburban rail beku“, “Cycling and footpaths beku“. The organizations supporting the campaign include “Citizens for Bengaluru”, “Bengaluru Bus Prayanikara Vedike”, Environment Support Group, Bangalore Environment Trust, CIVIC, Garment & Textile Workers Union etc, student groups such as The Student Outpost, Students for Development and many residents associations from across the city. Representatives of all supporting groups spoke about why they are opposed to the project, their vision for a more livable city and alternative ideas and solutions to address the traffic problems in Bangalore. A series of demands were presented and approved by the gathering, which will be presented to the government as the collective demands of the campaign. The demands include doubling the bus fleet, reducing the bus fares, introducing bus lanes on ORR and other arterial roads, improving connectivity and access of bus services, fast tracking completion of Metro and suburban rail, making the city safe for cycling and walking and introducing high parking fees and congestion taxes to discourage private vehicles. “Not a handful of elites and activists but 2500 citizens from slums, RWAs, restoration groups, transport groups, environmental groups, women’s groups, students, garment workers, urban planners and people cutting across the demographic from over 60 organisations came out on the streets in the hot sun to say #TenderCancelMaadi. The elevated corridor project is plain anti-development & will clearly penalise Bengaluru economically. Suffering a decade of digging, construction, debris and dust will impoverish small businesses, eateries, retailers and vendors along the route. Worse, it will bring traffic from the peripheral areas right through the heart of the city to reach the the outers instead of using peripheral roads and suburban trains. Wholesale markets should be moved out of the city like all other metros instead of welcoming trucks into the heart of the city,” said Tara from Citizens for Bangalore. Pravir from Whitefield Rising, a residents group, said that they seek priority for public transport. “We participated in today’s protest and have also released a letter to Chief Minister. There is vast scope for improvement in train and bus services in our area”. Srinivas Alavilli of Citizens for Bengaluru said “Brand Bengaluru is trees, not flyovers. Brand Bengaluru is people, not vehicles. The elevated corridor project threatens Brand Bengaluru and that’s why thousands came out today to demand in one voice “#TenderRadduMaadi” and instead put all the focus on public transport first. We humbly and loudly say “concrete saaku!” “public consultations beku”. The gathering lasted for two and a half hours, people listened and talked, sang songs, shouted slogans, displayed their beautifully crafted banners and posters and placards and celebrated the alternatives in its diverse forms and parted with a solemn commitment to not let elevated corridors go ahead “on their watch”. The campaign was happy to note that the Chief Minister has responded to the protest on Twitter. While the campaign is happy to meet the CM to discuss, the organizers emphasized the need to follow the constitutionally and legally mandated due process for city planning; for example, the Karnataka Town and Country Planning Act should be followed before taking up such projects. None of us would go about building our own homes without a well thought out plan. Why should we be willing to accept such an approach for our own home, the great city of Bengaluru? How have things changed for cab drivers in Bengaluru? With the app based cab aggregators occupying space in the city’s transport system, how has it changed the lives of cab drivers? Do they really earn up to Rs 60,000-80,000 a month?